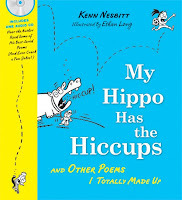 Poet Kenn Nesbitt is celebrating his birthday today, as well as the imminent release of what is sure to be a hit, My Hippo Has the Hiccups, a new poetry book-plus-audio-CD produced by Sourcebooks. 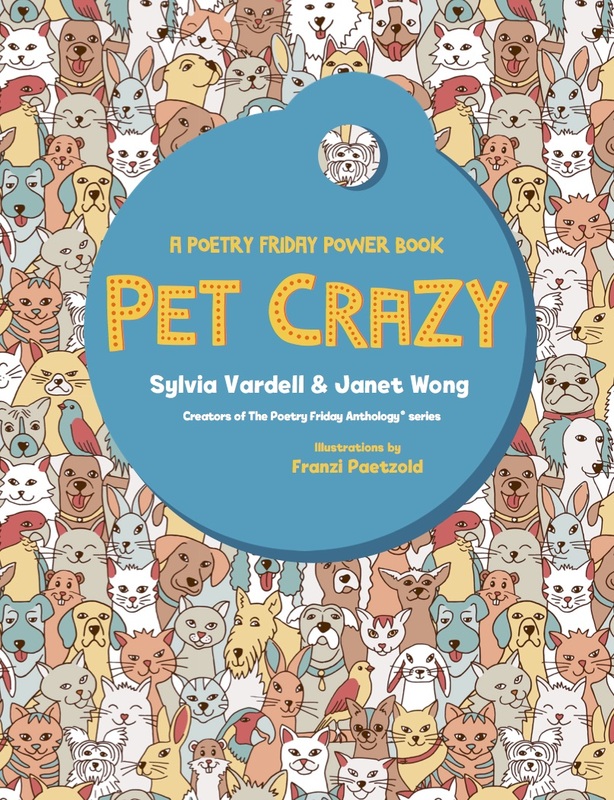 This Silverstein-Prelutsky-influenced collection of 120 poems caters to kids’ voracious appetites for humorous story poems, with plenty of silly pet poems, fairy tale parodies (another Cinderella poem for my collection! 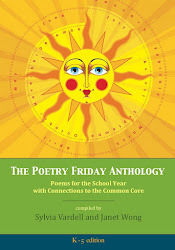 ), and funny school poems, many topics with strong kid appeal. Nesbitt relies heavily on formulaic rhyming quatrains that kids will quickly chime in on—especially after listening to the CD performed by Nesbitt himself. Once again, the audio is one of my favorite components and I’m so glad to see Sourcebooks continue to offer poetry for kids in audio form. Nesbitt is a strong performer of his own works, with a strong, clear delivery and pacing that is just right for the poem and the audience. The pause between tracks is also helpful for listeners and Nesbitt manages to make each track distinctive, using a variety of voicing and sound effects. 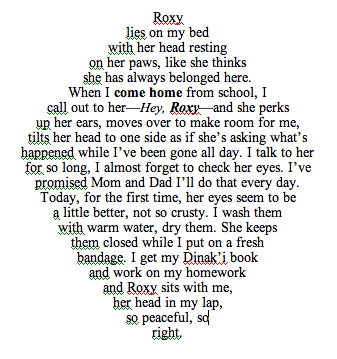 Even without the text in front of her/him, the young reader can easily follow the poem—and that’s not as easy as it sounds. 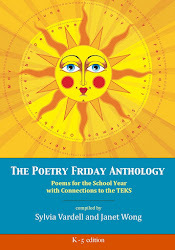 There are 39 (out of the 120) poems available on the CD including most of the best of the collection, IMO, like “I Played a Game” which begs for kid pantomime or movement to accompany the audio, “(I’m Always in Parentheses)” which actually gives voice to the ignoble parentheses, and “Pet Shopping” with a lively backdrop of animal noises, to name a few. Kids will surely want to plug the CD in the car and join in—and I think the CD will hold up to repeated listening. My favorite poems are probably those that diverge from the ever-present rhyming pattern (like the list format of “The Contents of My Desk” below) or incorporate clever wordplay (like “Anna Graham” = anagram) or punctuation-play (like “Hap-the-Happy-Hyphenator”). I hope Nesbitt will venture further into this inventive territory in the future. A ring for my pinky. A love note from Hannah. The lint from my pockets. My Hippo Has the Hiccups is illustrated with black and white cartoon sketches by artist and animator Ethan Long. 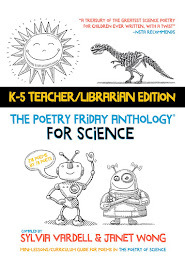 They have just the right touch of zany looseness to suit the poems and engage kid readers—and aspiring cartoonists. 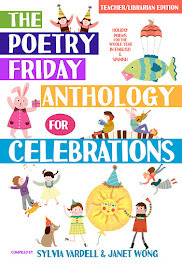 Kenn Nesbitt’s web site, Poetry4Kids is one of the most popular and visited sites for kids on poetry, offering a multitude of resources and opportunities for kids to interact. He clearly has a heart for kids and their funny bones. He writes, “I know it always makes me feel good when I read a funny poem or hear a funny song. So, in my own small way, I'm trying to do my part to help people laugh, and just maybe make the world a happier place.” Happy birthday to YOU, Kenn. Thanks for hiccupping hippos! 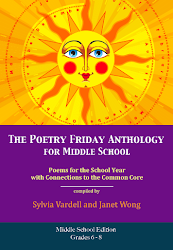 Join the Poetry Friday crew at the holly and the ivy. 1. Andrews, Julie and Hamilton, Emma Watson. 2009. Julie Andrews' Collection of Poems, Songs, and Lullabies. Ill. by James McMullan. New York: Little Brown. 2. Franco, Betsy. 2009. Curious Collection of Cats. Ill. by Michael Wertz. San Francisco, CA: Tricycle Press. 3. Franco, Betsy. 2009. Messing Around the Monkey Bars and other School Poems for Two Voices. Ill. by Jessie Hartland. Cambridge, MA: Candlewick. 4. Frost, Helen. 2009. Crossing Stones. New York: Farrar, Straus & Giroux. 5. George, Kristine O’Connell. 2009. Emma Dilemma: Big Sister Poems. Illus. by Nancy Carpenter. New York: Clarion. 6. Harley, Avis. 2009. African Acrostics; A Word in Edgeways. Ill. by Deborah Noyes. Cambridge, MA: Candlewick. 7. Harrison, David. 2009. Vacation, We’re Going to the Ocean! Ill. by Rob Shepperson. Honesdale, PA: Wordsong/Boyds Mills Press. 8. Hughes, Ted. 2009. My Brother Bert. New York: Farrar, Straus & Giroux. 9. Janeczko, Paul. 2009. 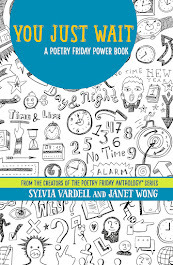 A Foot in the Mouth; Poems to Speak, Sing, and Shout. Ill. by Chris Raschka. Cambridge, MA: Candlewick. 10. Katz, Bobbi. 2009. More Pocket Poems. Ill. by Deborah Zemke. New York: Dutton. 11. Lewis, J. Patrick. 2009. The House. Illus. by Roberto Innocenti. Minneapolis, MN: Creative Editions. 12. Maddox, Marjorie. 2009. Rules of the Game. Ill. by John Sandford. Honesdale, PA: Wordsong/Boyds Mills Press. 13. Mora, Pat. 2009. Dizzy in My Eyes. New York: Knopf. 14. Prelutsky, Jack. 2009. The Swamps of Sleethe; Poems From Beyond the Solar System. Ill. by Jimmy Pickering. New York: Knopf. 15. Roemer, Heidi. 2009. Whose Nest is This? NorthWord. 16. Rosen, Michael J. 2009. The Cuckoo’s Haiku and Other Birding Poems. Ill. by Stan Fellows. Cambridge, MA: Candlewick. 17. Salas, Laura. 2009. Stampede! 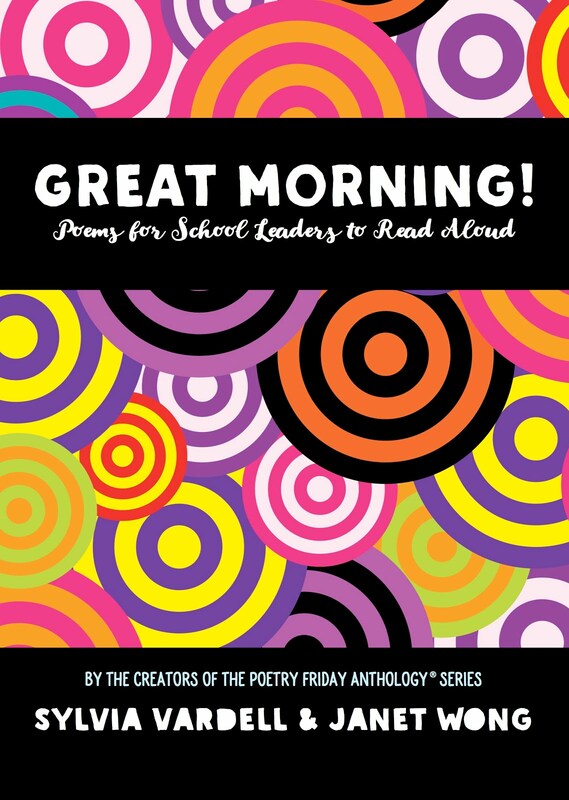 Poems to Celebrate the Wild Side of School. New York: Clarion. 18. Salinger, Michael. 2009. 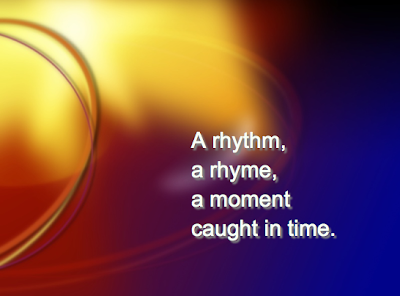 Well Defined; Vocabulary in Rhyme. Ill. by Sam Henderson. Honesdale, PA: Wordsong/Boyds Mills Press. 19. San Jose, Christine and Johnson, Bill. 2009. Every Second Something Happens: Poems for the Mind and Senses. Honesdale, PA: Wordsong/Boyds Mills Press. 20. Schertle, Alice. 2009. Button Up! Wrinkled Rhymes. Ill. by Petra Mathers. New York: Harcourt. 21. Schmidt, Amy. 2009. Loose Leashes. Ill. by Ron Schmidt. New York: Random House. 22. Sidman, Joyce. 2009. Red Sings From Treetops; A Year in Colors. Ill. by Pamela Zagarenski. Boston: Houghton Mifflin. 23. Walker, Rob D. 2009. Mama Says: A Book of Love For Mothers and Sons. Ill. by Leo and Diane Dillon. New York: Scholastic. 24. Yolen, Jane. 2009. A Mirror to Nature. Ill. by Jason Stemple. Honesdale, PA: Wordsong/Boyds Mills Press. 25. Yolen, Jane. 2009. An Egret’s Day. Honesdale, PA: Wordsong/Boyds Mills Press. 26. Yolen, Jane. 2009. How Do Dinosaurs Say I Love You? New York: Scholastic. 1. Bryant, Jen. 2009. Kaleidoscope Eyes. New York: Knopf. 2. Chaltas, Thalia. 2009. Because I Am Furniture. New York: Viking. 3. Herrick, Steven. 2009. Cold Skin. Asheville, NC: Front Street. 4. Myers, Walter Dean. 2009. Amiri and Odette: A Love Story. Ill. by Javaka Steptoe. New York: Scholastic. Yolen, Jane. 2009. My Uncle Emily. Ill. by Nancy Carpenter. New York: Philomel. 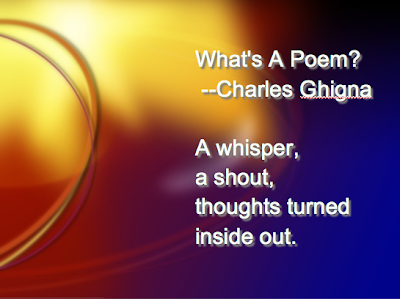 And just for fun, I’m trying a stanza-by-stanza embedded PowerPoint as a visual way to share a fun poem that Charles Ghigna gifted me on one of my favorite topics: what is poetry? Enjoy! 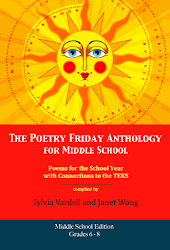 Join the whole Poetry Friday crew at: Wild Rose Reader hosted by the fabulous Elaine Magliaro. 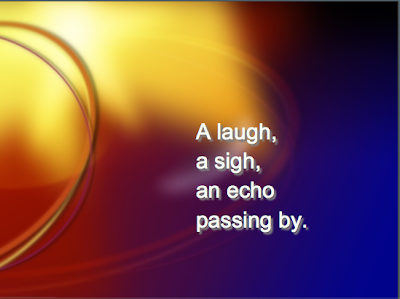 When the big ALA book awards are announced, I like to check them for the inclusion of poetry. Last year, there was a jackpot of poetry. This year—not so much. However, there were some notable standouts. First, the Coretta Scott King award choices were especially exciting this year. Did you notice that nearly all these books were POETRY? I was so tickled about that! *Keeping the Night Watch by Hope Anita Smith. Illustrated by E.B. Lewis. Henry Holt, 2008. *The Blacker the Berry by Joyce Carol Thomas. Illustrated by Floyd Cooper. Amistad/HarperCollins, 2008. *Becoming Billie Holiday by Carole Boston Weatherford. Illustrated by Floyd Cooper. Wordsong, 2008. *The Blacker the Berry illustrated by Floyd Cooper. 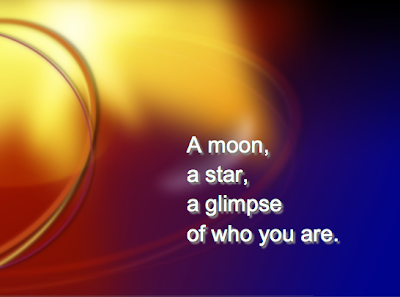 Written by Joyce Carol Thomas. Amistad/HarperCollins, 2008. And one CSK Illustrator Honor distinction went to a book by poet Carole Boston Weatherford and illustrated by Sean Qualls, Before John Was a Jazz Giant: A Song of John Coltrane. Henry Holt, 2008. *Shadra Strickland (illustrator) for Bird by Zetta Elliott. Lee & Low, 2008. In addition, the Pura Belpré Author Award (cosponsored by REFORMA) (outstanding writing by a Latino author) went to The Surrender Tree: Poems of Cuba’s Struggle for Freedom by Margarita Engle. 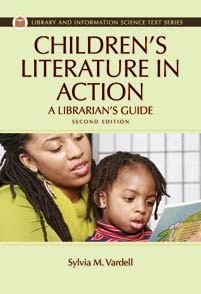 Henry Holt, 2008, which was also a NEWBERY HONOR BOOK! Did you catch that? Newbery! ALL of these books (listed above) are also on the list of 2009 Notables selected by ALSC and/or the YALSA list of Best Books for Young Adults (BBYA). *High, Linda Oatman. Planet Pregnancy. 2008. Boyds Mills Press. *Hopkins, Ellen. Identical. 2008. McElderry. *Neri, G. Chess Rumble. 2007. Lee and Low Books. What do you notice about this? MULTICULTURAL POETRY is really getting some attention. 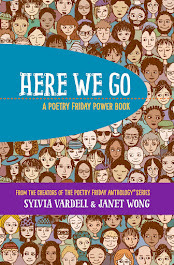 In fact, some of the best of the best books of any genre, and of poetry in particular, are by poets of color! Very exciting!